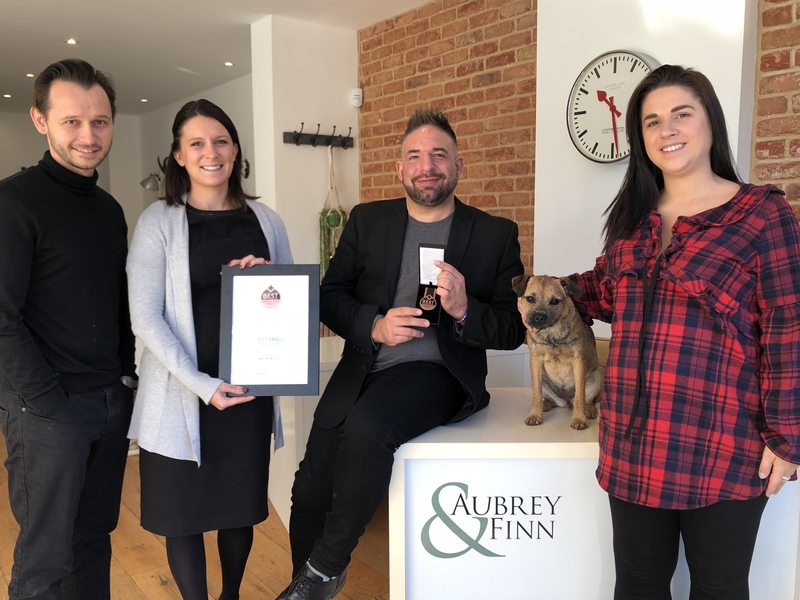 This month marked a prestigious win for all of us here at Aubrey and Finn, as we’ve been toasting our success after winning an award at the Estate Agency (EA) Masters Awards in London! We are humbled, and excited to announce that we were recognised as “Best Estate Agency Business” in the ‘Small Agent’ category for the London East region. Seeing off competition from a whole host of other estate agents, we were the only local agent to win an award in this category! The EA Masters awards are run by the Property Academy, in association with popular property website Right move. They celebrate and recognise the performance and achievements of the top five percent of Estate Agents throughout the whole of the UK. Yes, we are officially in the top 5%! Winners and finalists were assessed, via Right move, over a six month period, on four key areas including Sales and Letting results, Customer experience, market share, and success in marketing properties. Mystery Shopping scores also contributed to the results. The awards are a highly sought after endorsement of achievement, hard work, determination and enterprise within the Estate Agency Industry. Ben Colling, our Sales Manager attended the ceremony. Ben says “We’re chuffed to bit with this award”. “It’s nice to know that you are recognised and appreciated within your industry as an independent estate agent offering a unique perspective, innovative approach and personalised service to your clients”. Often in our industry, it’s easy to think that Estate Agency is just about buying, selling and renting, but for our clients, it’s can be a very emotional and emotive time, often triggered by a huge life change or shift. So it’s really fulfilling to know that we are supporting our customers through some of the biggest decision making purchases of their lives. To then be recognised for doing a good job of helping our clients with an award, given by our industry movers and shakers is so important. The EA Masters also celebrate enterprise and innovation in Estate Agency, something which we here at Aubrey and Finn are no strangers to. We like to move with the times and respond to global changes on a local level, which is why a couple of years ago, we created our new “Air Hosting” managed Airbnb service, which for us is transforming the way our clients rent out their homes. Landlords often think that renting their home for long periods of time is the best way to earn a return on their investment, but our landlords can typically earn 50-100% more through our managed Airbnb “Air Hosting” Service than renting their property out monthly, plus they have the flexibility of being able to stay in the property when they need to, so it’s great if they work out of the area and want to come home at weekends, or have a second property which they may sometimes need to use. Lots of Business Awards are won through self-entrance, or through nomination and popular vote, but the EA Masters awards is a set of awards based on facts and figures, hard work and customer service, so we are absolutely thrilled to win! This award is an endorsement to the hard work of all of the team here at Aubrey and Finn. We are very proud that we have been recognised as an estate agency in the local area, which provides a high quality service, and which goes above and beyond for our clients. If you are considering selling, buying, or renting out property, you would like more information on our managed Airbnb service, or you just have questions about the state of the property market locally, then why not give us a call, or pop in for a no obligation conversation!